The objective of carotid endarterectomy (CEA) is to prevent strokes. In the United States, stroke is the fifth leading cause of death overall, and women have a higher lifetime risk of stroke than men do. [1, 2] Among patients suffering a stroke, 50-75% had carotid artery disease that would have been amenable to surgical treatment. Several prospective randomized trials have compared the safety and efficacy of CEA with those of medical therapy in symptomatic and asymptomatic patients. Data from these prospective trials have confirmed that CEA offers better protection from ipsilateral strokes than medical therapy alone in patients presenting with either symptomatic or asymptomatic carotid artery disease. CEA is contraindicated if the patient’s general condition includes a serious illness that will substantially increase perioperative risk or shorten life expectancy. It is also contraindicated in patients who present acutely with a major stroke or in patients who experienced a major devastating stroke with minimal recovery or a significantly altered level of consciousness. The traditional teaching was that emergency CEA in an acutely occluded carotid artery might convert an ischemic cerebral infarct to a hemorrhagic infarct, possibly resulting in death. The timing of the operation was considered optimal when the patient reached optimal recovery before elective CEA was performed. However, a few reports of improved neurologic outcomes with early intervention in patients with acute nonhemorrhagic strokes have emerged. Careful patient selection is essential. In a study of perioperative and long-term outcomes after CEA in hemodialysis patients, Cooper et al found that the risks of CEA in asymptomatic dialysis-dependent patients were high, possibly outweighing the benefits. They also found the risk to be high in symptomatic patients and suggested that it should be offered only to a small and carefully selected cohort of these patients. A solid understanding of the anatomy of the carotid vessels and adjacent structures (see the image below) is critical for performing CEA effectively and minimizing complications. Anatomy of internal carotid and vertebral arteries. The aortic arch provides the great vessels, including the innominate artery, the left common carotid artery (CCA), and the subclavian artery. In the most common configuration, the innominate artery branches into the right subclavian artery and the right CCA. Vertebral arteries branch off the subclavian arteries bilaterally. On each side, the CCA travels within the carotid sheath before branching into the ipsilateral internal carotid artery (ICA) and external carotid artery (ECA). The ECA primarily supplies blood to the face and includes branches of the superior thyroid and ascending pharyngeal arteries. The ICA has no extracranial branches. 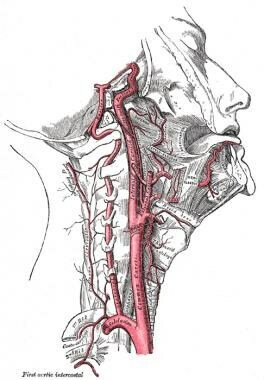 The carotid sinus is a baroreceptor located at the carotid bifurcation (where the CCA bifurcates into the ICA and the ECA) and is innervated by the nerve of Hering, a branch from cranial nerve IX (the glossopharyngeal nerve). The carotid bifurcation also contains the carotid body, which functions as a chemoreceptor responding to low oxygen levels or high carbon dioxide levels. The ICA has an intracranial branch called the ophthalmic artery, which collateralizes and communicates with the external carotid blood supply. The ophthalmic artery is a common location for carotid emboli, which may result in transient monocular blindness (TMB) if they dissolve quickly or central retinal artery occlusion and blindness if they do not. The intracranial circle of Willis provides further communication between the ICA, the ECA, and the vertebrobasilar system. For more information about the relevant anatomy, see Arterial Supply Anatomy, Arteries to the Brain and Meninges, and Circle of Willis Anatomy. Heart disease and stroke statistics 2017 at-a-glance. American Heart Association/American Stroke Association. Available at http://www.heart.org/idc/groups/ahamah-public/@wcm/@sop/@smd/documents/downloadable/ucm_491265.pdf. 2017; Accessed: May 15, 2017. Benjamin EJ, Blaha MJ, Chiuve SE, et al, American Heart Association Statistics Committee and Stroke Statistics Subcommittee. Heart Disease and Stroke Statistics-2017 Update: A Report From the American Heart Association. Circulation. 2017 Mar 7. 135 (10):e146-e603. [Medline]. [Full Text]. [Guideline] Ricotta JJ, Aburahma A, Ascher E, Eskandari M, Faries P, Lal BK, et al. Updated Society for Vascular Surgery guidelines for management of extracranial carotid disease. J Vasc Surg. 2011 Sep. 54 (3):e1-31. [Medline]. Beneficial effect of carotid endarterectomy in symptomatic patients with high-grade carotid stenosis. North American Symptomatic Carotid Endarterectomy Trial Collaborators. N Engl J Med. 1991 Aug 15. 325(7):445-53. [Medline]. Endarterectomy for asymptomatic carotid artery stenosis. Executive Committee for the Asymptomatic Carotid Atherosclerosis Study. JAMA. 1995 May 10. 273(18):1421-8. [Medline]. [Guideline] Kernan WN, Ovbiagele B, Black HR, et al, American Heart Association Stroke Council, Council on Cardiovascular and Stroke Nursing, et al. Guidelines for the prevention of stroke in patients with stroke and transient ischemic attack: a guideline for healthcare professionals from the American Heart Association/American Stroke Association. Stroke. 2014 Jul. 45 (7):2160-236. [Medline]. Salem MK, Sayers RD, Bown MJ, Eveson DJ, Robinson TG, Naylor AR. Rapid access carotid endarterectomy can be performed in the hyperacute period without a significant increase in procedural risks. Eur J Vasc Endovasc Surg. 2011 Feb. 41(2):222-8. [Medline]. Cooper M, Arhuidese IJ, Obeid T, Hicks CW, Canner J, Malas MB. Perioperative and Long-term Outcomes After Carotid Endarterectomy in Hemodialysis Patients. JAMA Surg. 2016 Oct 1. 151 (10):947-952. [Medline]. Landis GS, Faries PL. A critical look at "high-risk" in choosing the proper intervention for patients with carotid bifurcation disease. Semin Vasc Surg. 2007 Dec. 20 (4):199-204. [Medline]. Qin F, Sun Y, Hu W, Wei X, Li Z, Zhou J, et al. The relationship between preoperative serum cortisol level and the stability of plaque in carotid artery stenosis patients undergoing carotid endarterectomy. J Thorac Dis. 2016 Jul. 8 (7):1611-7. [Medline]. [Full Text]. Schechter MA, Shortell CK, Scarborough JE. Regional versus general anesthesia for carotid endarterectomy: the American College of Surgeons National Surgical Quality Improvement Program perspective. Surgery. 2012 Sep. 152(3):309-14. [Medline]. Ricotta JJ, DeWeese JA. Is routine carotid ultrasound surveillance after carotid endarterectomy worthwhile?. Am J Surg. 1996 Aug. 172(2):140-2; discussion 143. [Medline]. Lal BK, Beach KW, Roubin GS, Lutsep HL, Moore WS, Malas MB, et al. Restenosis after carotid artery stenting and endarterectomy: a secondary analysis of CREST, a randomised controlled trial. Lancet Neurol. 2012 Sep. 11(9):755-63. [Medline]. Geraghty PJ, Brothers TE, Gillespie DL, Upchurch GR, Stoner MC, Siami FS, et al. Preoperative symptom type influences the 30-day perioperative outcomes of carotid endarterectomy and carotid stenting in the Society for Vascular Surgery Vascular Registry. J Vasc Surg. 2014 Sep. 60(3):639-44. [Medline]. Bonati LH, Dobson J, Featherstone RL, Ederle J, van der Worp HB, de Borst GJ, et al. Long-term outcomes after stenting versus endarterectomy for treatment of symptomatic carotid stenosis: the International Carotid Stenting Study (ICSS) randomised trial. Lancet. 2015 Feb 7. 385 (9967):529-38. [Medline]. Kakisis JD, Antonopoulos CN, Moulakakis KG, Schneider F, Geroulakos G, Ricco JB. Protamine Reduces Bleeding Complications without Increasing the Risk of Stroke after Carotid Endarterectomy: A Meta-analysis. Eur J Vasc Endovasc Surg. 2016 Sep. 52 (3):296-307. [Medline]. Hye RJ, Mackey A, Hill MD, Voeks JH, Cohen DJ, Wang K, et al. Incidence, outcomes, and effect on quality of life of cranial nerve injury in the Carotid Revascularization Endarterectomy versus Stenting Trial. J Vasc Surg. 2015 May. 61 (5):1208-14. [Medline]. Ascher E, Markevich N, Schutzer RW, Kallakuri S, Jacob T, Hingorani AP. Cerebral hyperperfusion syndrome after carotid endarterectomy: predictive factors and hemodynamic changes. J Vasc Surg. 2003 Apr. 37(4):769-77. [Medline].